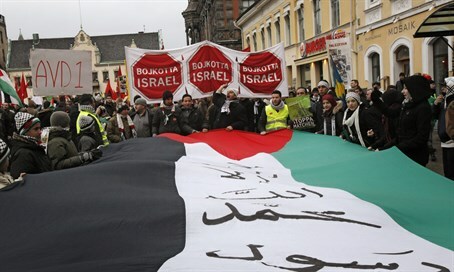 Anti-Israel rally in Malmo turns ugly quickly; Israeli Ambassador urges authorities to useing 'full force of the law' against inciters. A large anti-Israel demonstration last Sunday in Sweden featured calls to "slaughter the Jews" and chants praising the stabbing of innocent Israelis, footage from the event has shown. Israel's Ambassador to Sweden Isaac Bachman posted video of the rally, which took place in the city of Malmo, on his Facebook page on Monday. It shows a large crowd of mostly Arabic-speaking protesters holding Palestinian flags and openly calling for an "intifada" (i.e. violent terrorist campaign) against Israel. At one point the crowd begins a long responsive chant which begins with the words "slaughter the Jews" (Itbach al-Yahud) and featured calls to stab "with a knife." "These are extremely troubling instances of a grotesque but nevertheless very real – and murderous – incitement which must be dealt with by the full force of the law!" Bachman commented. Incitement by Arabs in Judea, Samaria and Gaza has been rampant and widely documented, as has the seemingly endless volume of online incitement, much of it emanating from Hamas and Fatah-linked accounts in Gaza, Judea-Samaria and Jerusalem. But the video from Malmo - where the small Jewish community of several hundred has faced a worrying rise in anti-Semitism over the past several years, mainly at the hands of Muslim immigrants - highlights how such incitement is also present among anti-Israel activists in Europe and elsewhere. During last year's Operation Protective Edge such incitement was out in full force, as Jews in Europe were subject to an alarming wave of anti-Semitism by pro-Palestinian activists.